BMW's first all electric car, the BMW i3, has the driving range and charging system to almost support proper road trips. Today, BMW announced details of their first all electric production electric car, the BMW i3. BMW made it a splashy unveiling, with simultaneous meetings in Beijing, London and New York City, along with a series of videos posted on YouTube. What counts, though, is how well an electric car fits ones lifestyle, most importantly will the charging system give sufficient flexibility and driving range? The 22 kilowatt-hour battery pack on the BMW i3 is claimed by BMW for a driving range between 130-200 kilometers (electric only; 80-120 miles) depending on driving habits, whether ECO PRO or ECO PRO+ modes are being used, and and the test cycle being used. They have not announced an EPA certified range figure. The battery pack is smaller than some of the other electric cars, yet BMW claims a longer driving range, which may be due to the extensive use of carbon-fiber in the car. Normal charging: The on-board J1772 charging unit supports a 240 volt 32 amp charging speed (7 kilowatts). BMW offers the "BMW i Wallbox" as a home charging station, and of course one can charge at public J1772 charging stations. A full recharge curiously requires 3 hours at the full 7 kilowatt charging rate, or longer periods at lower charging rates. The BMW i Wallbox was developed in partnership with Schneider Electric, and includes electrical installation services in the customers home. Fast charging: An option on the BMW i3 is to outfit it with a SAE DC Fast Charging port (a.k.a. Combined Charging System). This fast charging system is not compatible with the CHADEMO fast charging stations that are already publicly installed. Instead, use of this system will have to wait for deployment of Combined Charging compatible fast charging stations. At such a station, a BMW i3 can get an 80% recharge in about a half hour. Station locations: Between the level 2 J1772 charging, and the fast charging, the BMW i3 is as usable for traveling around a city as any of the other electric cars. The range is similar as is the charging speed. The infotainment system includes data on available public charging stations as well as a dynamic range display. This gives information that BMW claims will be up-to-date and precise, giving an estimate of sufficient charge to reach the next destination. 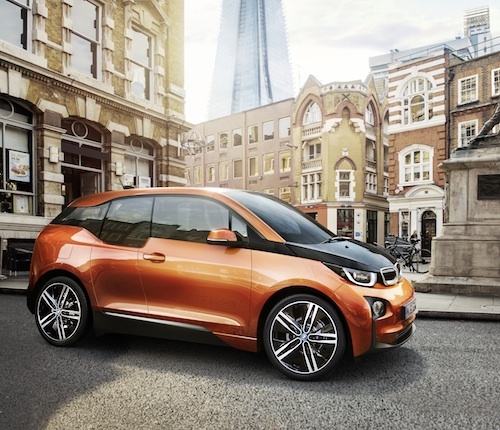 The i3 has on-board data communications capability, and back-end servers operated by BMW assist with range calculations. Gasoline range extender: Unique among the electric or plug-in hybrid cars is the BMW i3's range extender engine. Unlike a plug-in hybrid where the range extender engine is full-size and also used to directly drive the wheels, BMW borrowed a 650cc two cylinder engine from their motorcycle division. It sits above the rear axle, adjacent to the electric motor, and generates 34 horsepower and is used solely to drive a generator. That electricity is directed to the battery pack, and in effect increases the total driving range of the BMW i3. BMW says it increases total range to over 180 miles, but this must be assuming that charging is only done at home. Clearly one could charge at home, and by combining use of the range extender and public charging stations while driving around during the day the total driving range could be quite longer. The range extender engine "maintains the charge of the lithium-ion battery at a constant level" rather than acting to recharge the pack. Public charging: Coupled with the launch of the BMW i3 is the ChargeNow service, that's part of the 360 degree ELECTRIC program. ChargeNow is offered in collaboration with ChargePoint, and is essentially BMW-branded access to the ChargePoint network. BMW invested in ChargePoint in 2012. In Europe the ChargeNow service is compatible with the Hubject service, that in will support use of charging stations owned by any charging network. With all these components to the BMW i3 charging system, BMW has covered all the elements necessary to make it so easy. Study Points To BMW 3 Series As Best Premium Car Deal For This Shopping Season - The Model 3 Effect? The Car Language Dilemma of Radio-Based DSRC v. Cellular Based V2X: VHS or Betamax? 100 Years Ago: Gas or Electric Car?